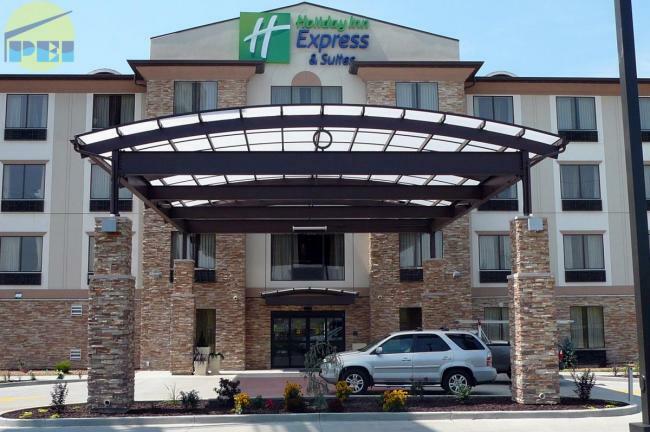 Hotel Entrance Canopy - Pool Enclosures, Inc. can custom bend structural aluminum framing for commercial canopies, porte cocheres, and walkways. 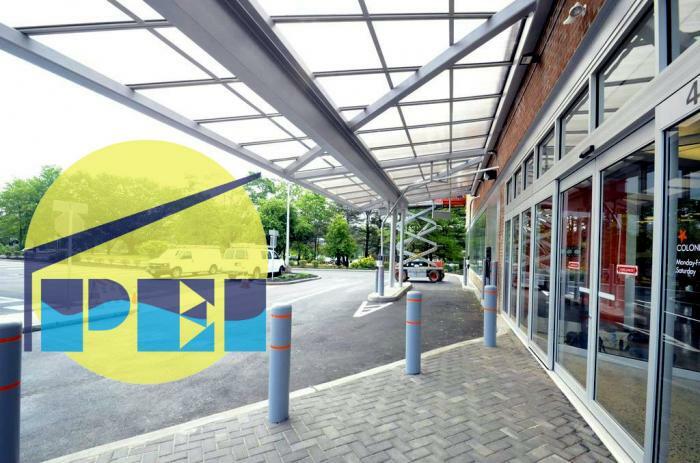 The full length mulitwall polycarbonate glazing makes an attractive light filtering covered entrance. 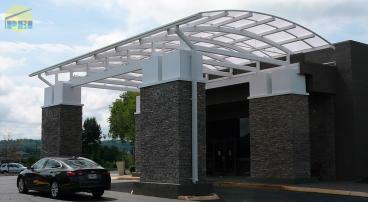 Below shows (2) curved top porte cocheres located in Johnson City, TN. on a Holiday Inn full service hotel. 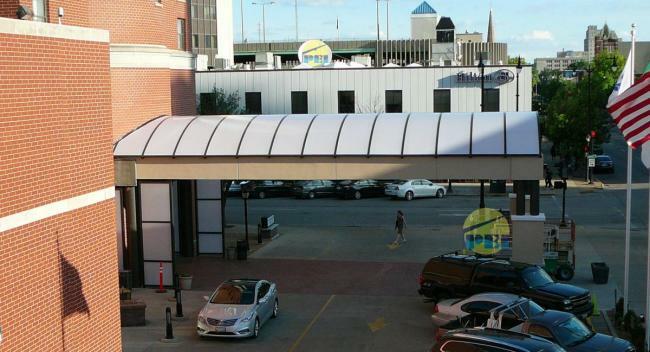 The dimensions are 57' x 57' and 24' x 49'. 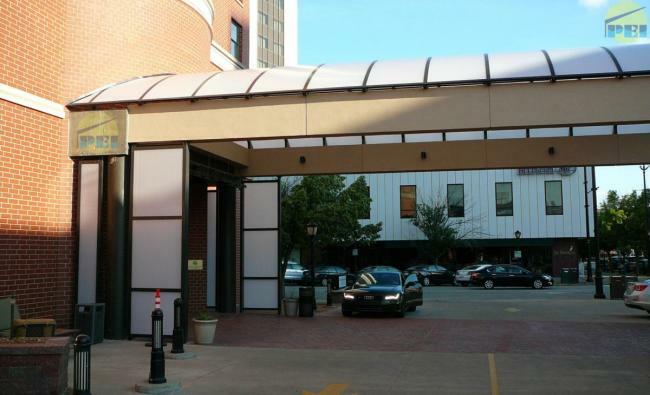 Below is a 25' wide x 55' long custom arched porte cochere for a high-rise hotel in downtown Springfield, Il. 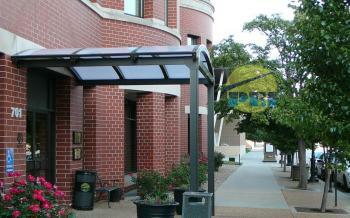 The covered entryway featured a vertical wind screens located near the entrance. 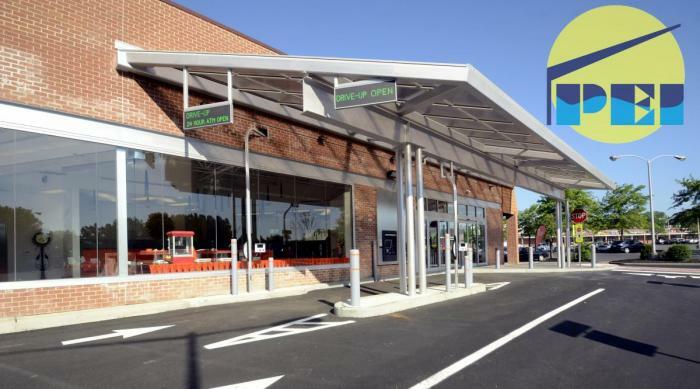 The structural arches were extruded aluminum framing with baked-on enamel dark bronze paint. The glazing is 25mm mulitiwall opal polycarbonate. Note the attachment to the curved brick bump-out. 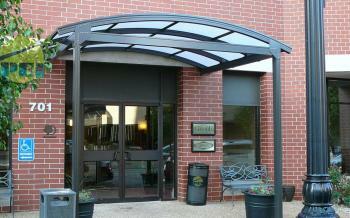 The project also included a small arched canopy over a side entrance. 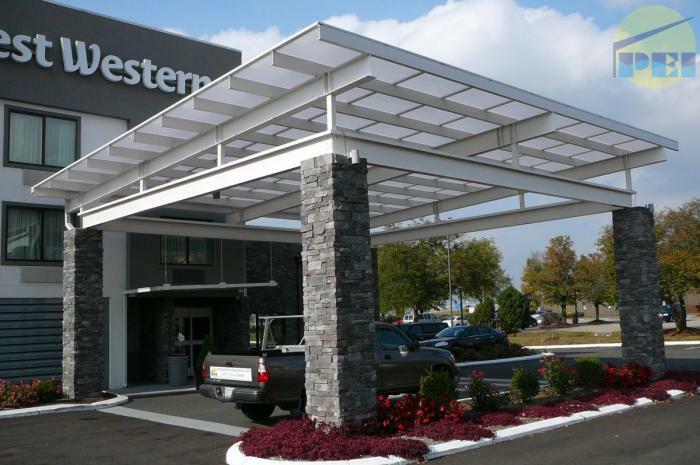 Here is a 37' x 37' flat roof style porte cochere for a Best Western. 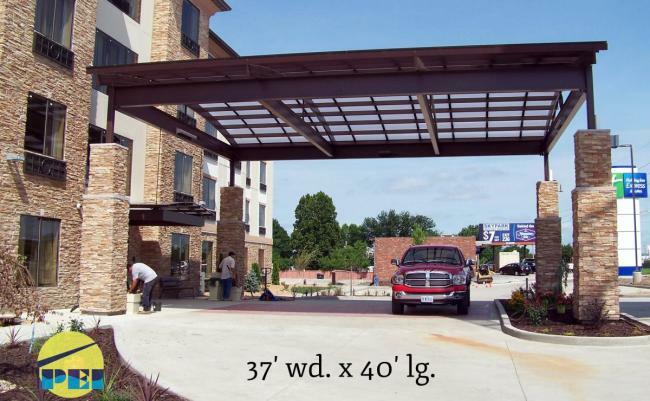 The steel sub-frame (by others) and the slightly sloping roof is separate from the hotel but includes a smaller canopy over the main entrance. The glazing is 25mm opal polycarbonate. 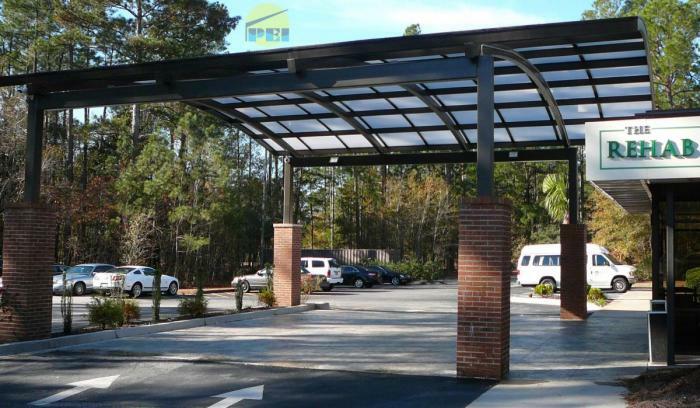 A dark bronze baked enamel painted 35' wide by 37' long curved roof Porte Cochere drive-thru for a nursing center located in South Carolina, blends well with the pine forest setting. 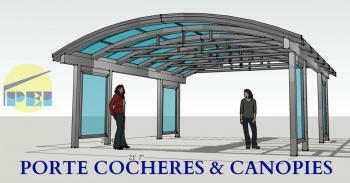 Below is a 20' x 73' shed-roof style porte-cochere for a bank drive-through. The lean-to shape is wider at the ridge than the eave and the 25mm bronze tint triplewall polycarbonate was installed on a 30 degree angle from ridge to eave. 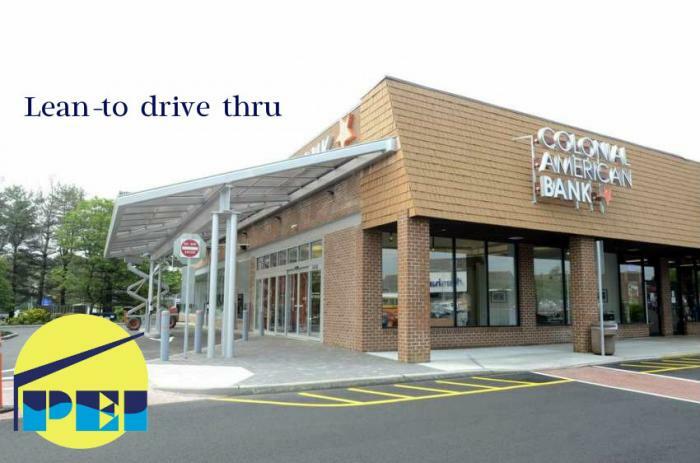 The custom silver frame color blends in architectually with the bank. 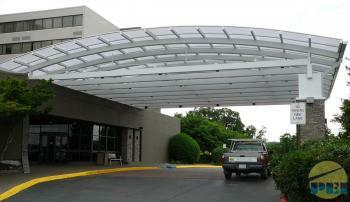 Below is a an 18' wide, 30 degree (7:12) roof slope, pyramid shaped Porte-Cochere. 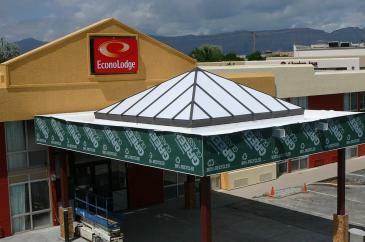 We pre-fabricated & pre-fitted this custom structure in the shop before shipping. All parts are pre-drilled & gasketed. 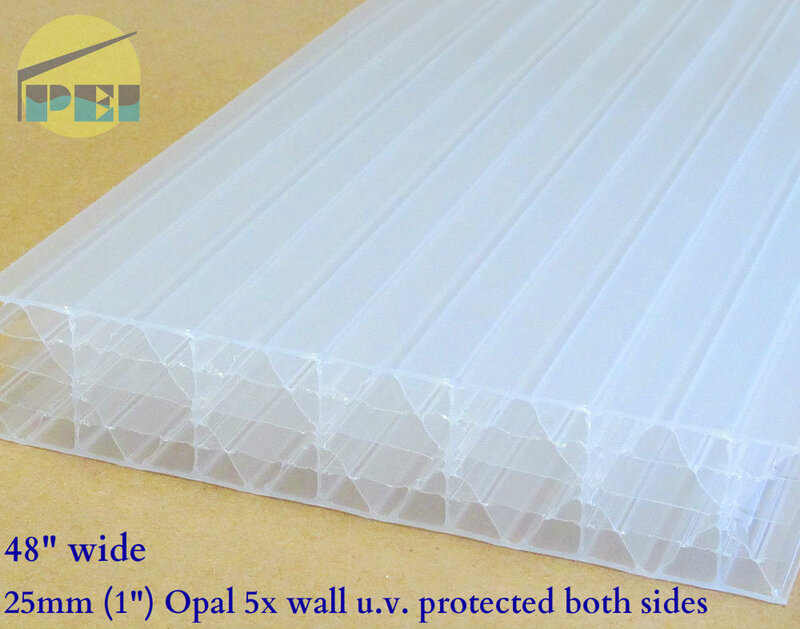 The 25mm (1") opal multiwall polycarbonate is pre-cut and taped. 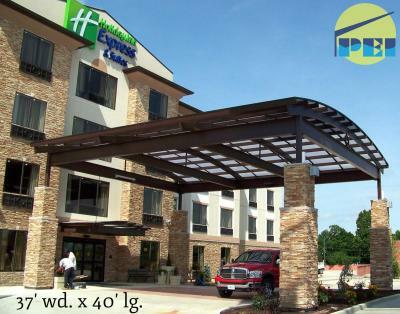 The structural aluminum framing has a baked-on enamel dark bronze paint finish. 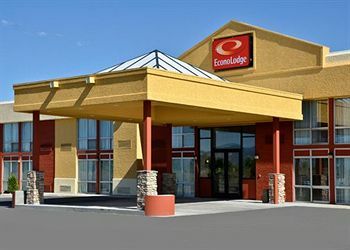 Located in Grand Junction, Co.